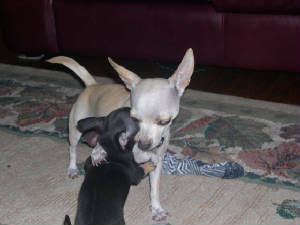 We currently only have two female chihuahua's. Daddy's Little Girl IV AKA "August" and Daddy's Little Socker Girl AKA "Socker". August is a Fawn and White female chihuahua, weighing at 6lbs 8oz. She is an applehead gal that loves the attention of all guests and will always go for a game of play. 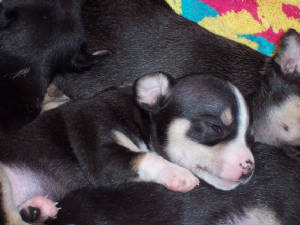 Socker is a beautifully marked blue/blk/white & tan tri-color female, weighing 5lbs 12oz. Although she doesn't look like she weighs over three. Socker is a deer head girl that will play fetch and also snuggle til the sun goes down.